Some households have water supplies that contain higher than desired levels of minerals. This condition is called hard water. There is nothing harmful about hard water but it does leave mineral deposits on pipes and appliances and makes cleaning a little bit more difficult. The solution is to have a water softener system which is basically a tank filled with salt that the household water passes through. This tank has to be refilled about every month and [David] was catching a little flak from his wife because he kept forgetting to fill it. He then set out to do what any great husband would do and built a Water Softener Monitor that reports the quantity of salt in the basement tank up to the living quarters. [David] started thinking that he should test the salinity of the water to determine if salt needed to be added but after thinking about it for a while decided against it because any metal in that salty water would surely corrode. A non-contact approach would be to use an IR distance sensor mounted to the top of the tank and measure the distance to the pile of salt that slowly lowers as it dissolves into the water. In this case, he used a Sharp GP2D12 that can measure accurately from 10 to 80cm. This home is heated by a wood stove in the winter, which also produces hot water. But the other three seasons it’s an electric water heater that does the work. 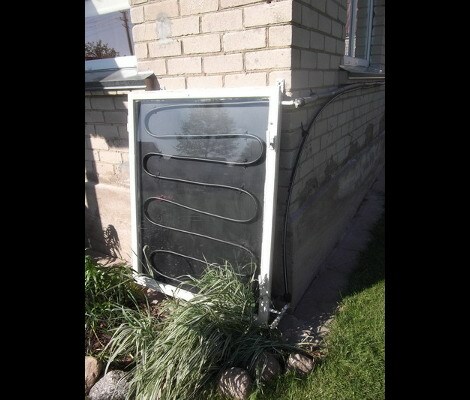 This latest hack is a solar collector meant to take over the hot water production work for the house. it uses basic building materials and rudimentary construction skills, making it much more approachable than trying to make electricity from the sun. It’s really just a wood box with a glass lid. The inside has been painted black, and the black tubing that snakes through it holds the water. A three-way valve lets the homeowner patch into the hot water reservoir. The collector is lower than the reservoir, so the heated water makes its way back into the tank as cooler water takes its place. Not bad for an entirely passive system! Want nature to supply you with 130-150 degree hot water? [Onestraw] shows you how to get just that by building a compost heap that heats water. Finding himself the proud owner of a dump truck of green wood chips [Onestraw] went about building his own version of Jean Pain’s thermal compost pile. 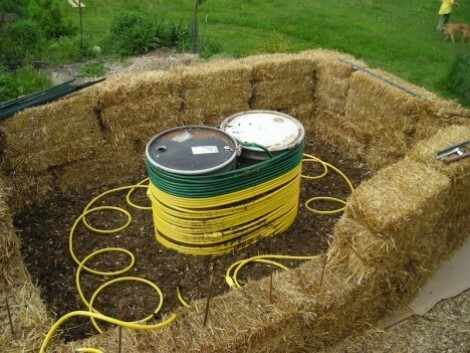 The idea is to produce and store methane generated from the compost pile but in order to do so, the temperature must be kept fairly low. The microorganisms in the compost generate a lot of heat trying to break down that matter and running water through the system will keep the temperature low enough for the methane-producers to be happy. The side effect of this cooling system is hot water coming out the other end. [Onestraw] even has plans to use salvaged car radiators to turn the hot water into a heating system for his home. Granted you’re not going to add this to your apartment, but if you have space and waste plant matter and need hot water this is a great way to get it.